We’ve seen a lot of artwork created from books, but not all of them have such a quirky focus on science. 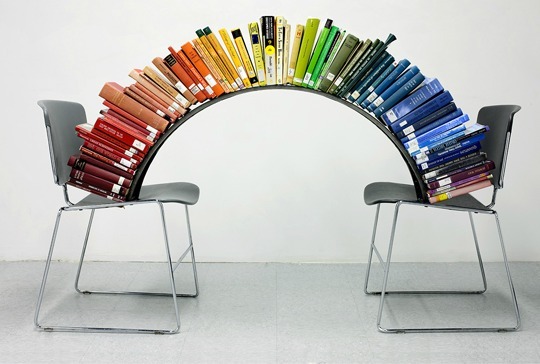 Aspen Mays created this unusual mini-library installation with her colorful rainbow sculpture ‘Every Book’. Paying homage to Albert Einstein‘s theories, Mays’ piece incorporates each of Einstein’s books available for lending at the Illinois Collegiate Inter-Library. May organized each book according to the color spectrum to create the rainbow formation, and then documented the sculpture through a series of photographs. Aspen May's creates an unusual sort of mini-library installation with her colorful rainbow sculpture. In reference to Albert Einstein's theories about light and gravity, May's documents every book available to loan by the acclaimed physicist from the Illinois Collegiate Inter-Library Loan service.